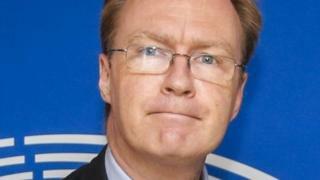 The UK's ambassador to the European Union, Sir Ivan Rogers, has resigned. Here is his message to staff in full. We have highlighted key passages in bold, and added BBC political reporter Justin Parkinson's commentary in italics. As most of you will know, I started here in November 2013. My four-year tour is therefore due to end in October - although in practice if we had been doing the Presidency my time here would have been extended by a few months. I know from experience - both my own hugely positive experience of working in partnership with Shan, and from seeing past, less happy, examples - how imperative it is that the PR and DPR operate as a team, if UKREP is to function as well as I believe it has done over the last few years. I know that this news will add, temporarily, to the uncertainty that I know, from our many discussions in the autumn, you are all feeling about the role of UKREP in the coming months and years of negotiations over "Brexit". My own view remains as it has always been. We do not yet know what the government will set as negotiating objectives for the UK's relationship with the EU after exit. Justin Parkinson: This could be read as a hurry-up to the UK government to decide what it actually wants from Brexit talks, expected to start as early as April. This differs from criticism from some MPs that not enough is being divulged - Sir Ivan is implying a lack of direction at the heart of government, rather than vagueness in its public message. And he is suggesting that UK diplomats in Brussels need to be better informed. But in any negotiation which addresses the new relationship, the technical expertise, the detailed knowledge of positions on the other side of the table - and the reasons for them, and the divisions amongst them - and the negotiating experience and savvy that the people in this building bring, make it essential for all parts of UKREP to be centrally involved in the negotiations if the UK is to achieve the best possible outcomes. JP: Sir Ivan is suggesting there's a danger the UK could be outclassed in the Brexit talks - and lose out as a result. Diplomats must be better prepared, he is apparently arguing. The government will only achieve the best for the country if it harnesses the best experience we have - a large proportion of which is concentrated in UKREP - and negotiates resolutely. Senior ministers, who will decide on our positions, issue by issue, also need from you detailed, unvarnished - even where this is uncomfortable - and nuanced understanding of the views, interests and incentives of the other 27. JP: Sir Ivan is saying that only civil servants, rather than campaigners and activists, can provide a true picture of the complexities ahead. The structure of the UK's negotiating team and the allocation of roles and responsibilities to support that team, needs rapid resolution. The great strength of the UK system - at least as it has been perceived by all others in the EU - has always been its unique combination of policy depth, expertise and coherence, message co-ordination and discipline, and the ability to negotiate with skill and determination. JP: Sir Ivan does not name those he is effectively accusing of over-optimism and naivety, but this could be read as a criticism of pro-Brexit ministers - those said to favour a "hard Brexit", under which the UK could leave the European single market and customs union and be subject to the rules of the World Trade Organization. There is much hard work ahead, it suggests. On a personal level, leaving UKREP will be a tremendous wrench. I have had the great good fortune, and the immense privilege, in my civil service career, to have held some really interesting and challenging roles: to have served four successive UK prime ministers very closely; to have been EU, G20 and G8 Sherpa; to have chaired a G8 Presidency and to have taken part in some of the most fraught, and fascinating, EU negotiations of the last 25 years - in areas from tax, to the MFF to the renegotiation. JP: The most-reported part of Sir Ivan's email, this implies that more planning is needed, and that ministers are unwilling to listen to the advice civil servants are offering. It gives a strong hint that his colleagues feel intimidated.